Prisoners across the United States launched a strike on August 21, demanding improved living conditions, greater access to resources, and the end of what they call “modern day slavery.” Prisoners in at least seventeen states are expected to participate in the strike, coordinating sit-ins, hunger strikes, work stoppages, commissary boycotts, from today until September 9 — the forty-seventh anniversary of the deadly Attica prison uprising in New York. Prisoners first called for the strike in April, after a bloody altercation broke out at the Lee Correctional Institution in South Carolina, leaving seven prisoners dead and seventeen others seriously injured. It was the deadliest prison riot in the United States in a quarter of a century. Six of the seven prisoners killed were African-American. The violence was allowed to continue for hours. One witness described bodies of dead prisoners, “literally stacked on top of each other.” No guards were hurt. The weeks-long strike began on the forty-seventh anniversary of the killing of Black Panther George Jackson, who was shot and killed by guards during an escape attempt from San Quentin prison. The strike is expected to be the largest prisoner action since the 2016 prison strike, which saw at least twenty thousand prisoners participating in collective action across eleven states, the largest prison work strike in US history. Amy Goodman of Democracy Now! recently spoke to three leaders of the prison justice movement to learn more about the strike. Cole Dorsey is a former prisoner and activist who helped organize the strike. He’s joined by Heather Ann Thompson, author of Blood in the Water: The Attica Prison Uprising of 1971 and Its Legacy; and Amani Sawari, a prison strike organizer working on behalf of Jailhouse Lawyers Speak, a network of prisoners who are helping organize the nationwide strike. They discussed the prisoners’ demands, the crucial history behind the strike, and what people on the outside can do to stand in solidarity with striking prisoners. Cole Dorsey, let’s begin with you. Lay out what this several-week strike is about. This has been completely prisoner-led. Jailhouse Lawyers Speak can speak more to that. But due to the brutality in Lee correctional facility earlier this year, it was decided that action had to be taken now. And that led to this list of demands, ten demands, that are really just a human rights declaration of basic demands that we would ask of any human across the world. But especially now that we’re going to start using prisons as warehouses, these issues are more and more relevant, like overcrowding prison conditions, lack of resources and for prisoners to gain those resources, and the continued institution of racism that it enforces, from chattel slavery. So, while those things continue, these conditions will only exacerbate into what they were in Lee correctional facility in South Carolina, where nine prisoners were murdered. And yes, it was a, quote-unquote, “gang situation,” but it was initiated by the guard officials. In my involvement in prison, they fed on that division among prisoners, whether it be religious or racial, so that they kept fighting among themselves instead of addressing the issues that were core demands for all of us, whether it be the exorbitant rates of commissary or the conditions or the torture or treatment or solitary. So, they really feed on those things. And that’s what’s really important about this strike and continuing on. What we’ve learned from the prison hunger strikes is an agreement to end hostilities. So, while there may be differences on religious and racial boundaries, we can still come together over these core demands, like this list of ten demands that these prisoners have drafted. And again, the demands are? Number one is the immediate improvements to all the conditions of prisons, and prison policies that recognize the humanity. This whole declaration is really a declaration of humanity. The humanity of imprisoned men and women — this is now almost 2.5 million people. These are our sons and daughters and mothers and fathers. These are people that are neighbors in our community, especially most marginalized working-class, poor people, black and brown people especially. So, an end to the draconian, racist laws, like gang enhancements, that automatically increase a person’s bid by ten years just because of their last name or their uncle or where they’re from, what part of town. It can be completely arbitrary. But, again, that points to the issue that it’s more about warehousing than it is about rehabilitation, or even making money through these corporations that do profit in the millions. But some other demands are like Pell Grants for prisoners. They should be paid for the work that they do. When I was in, I got thirteen cents an hour, so I was a disgruntled employee. I chose to find ways to sabotage my lawnmower so I didn’t have to mow the lawn. I don’t want to have to mow the lawn for thirteen cents an hour, you know, so I’m going to run over rocks and bushes. But it gets you out of the cell. That’s why people take these jobs. Or they give you incentives, you know, to have more freedom or have an extra cake during dinner, those kinds of things. This whole declaration is really a declaration of humanity. The humanity of imprisoned men and women — almost 2.5 million people. So, the major demands are Pell Grants reinstated; the end of the Prison Litigation Reform Act, so prisoners can start to, again, fight some of the conditions in the legal courts and have access to the legal library on a real basis, where they can really get the material and have assistance; an end to oversentencing, of black and brown people especially, the most marginalized communities; end to the racist gang enhancements. And again, we believe no human being should spend the rest of their life in prison. Some of the other strike leaders have mentioned how if these jobs, like meat packing and call center jobs, were offered at prevailing wages in the same communities that the prisoners came from, then they wouldn’t be in the prisons now. But the system has recognized that it’s easier to control the population while they’re inside prisons than it is if they’re outside, because outside they have the right to strike, they have federal protections, whereas inside it can just be called an insurrection. Automatically, the leaders are sent to solitary. Automatically, they’re transferred. Automatically, privileges are denied — no more family, no more phone calls. So, from a social justice and human rights aspect, it’s really draconian, and it’s a lost era. And the only way their voices are going to be heard is through us on the outside amplifying their voices and letting it be heard and known as much as we can through medias like this. I want to bring Amani Sawari into the conversation. Amani, this is planned for around seventeen states. What form will these actions will take? It really depends on the location and the status of the prisoner. So, as you mentioned earlier, prisoners have the ability to participate in the strike in a multitude of ways, one being work stoppages. So, if prisoners do have jobs in the prison, they can participate by refusing to go into work. The system has recognized that it’s easier to control the population while they’re inside prisons than it is if they’re outside, because outside they have the right to strike, they have federal protections, whereas inside it can just be called an insurrection. Automatically, the leaders are sent to solitary. Then, for prisoners that don’t even have access to spending money, they don’t have the privileges to do that. They’ll be participating through hunger strikes. So, regardless of where a prisoner is or what their status is, they are given food, and they can refuse to take that food. And that’s a way that they can participate in the strike, regardless of where they are or what their privilege status is. Cole just mentioned, in the list of demands, ending gang enhancement laws. Amani, explain what they are. So, racist gang enhancements are the act of labeling individuals with different gang associations just based on where they’re from or even the tattoo markings on their body. Those might be associated with a gang, and then prisoners are then labeled with that gang. And then, when they get into prison, really being a part of a gang is one of the only forms of insurance that a prisoner might have. So even if they weren’t associated with a gang prior to being incarcerated, they find themselves in those populations. And then, when prisoners refuse to be a part of a gang, they are subject to isolation. So, that’s really miserable being isolated within an isolated place. So a lot of prisoners just gravitate towards their racial groups, different gang groups, based on locations where they were from, the people that they see from high school, and then they just gravitate towards those groups. And that’s when seven people were killed, prisoners, correct? Yes, at least seven people were killed, but there have been numbers of nine and twelve. Actually, when prisoners were killed, a few were transferred to other prisons to sort of lower those numbers. But seven is the official number of prisoners that were killed. Cole, how do you organize? You’re on the other side of the bars now. You’re free. How are you helping to organize this strike on the outside? There’s a number of ways that we’ve learned to adapt to organize, and number one is through correspondence. We have regular correspondence. We do have members. I’ve got a phone call in my pocket that I keep on me twenty-four hours a day, and I receive phone calls from different facilities across the country, typically on the West Coast. But I can relay messages from one facility, within one facility to the same facility, just in different cellblocks, to let know what movement is happening, what’s going on. We found a number of different ways. The Bay View has been instrumental in getting the word out. San Francisco Bay View has been a publication for a number of years. It’s gone into facilities across the country, and it’s really been pivotal in spreading the word of this type of collective action that prisoners have been taking. But there’s a number of different ways that we’ve found to creatively get the message through to prisoners. And a lot of times it’s word of mouth. So, we’ll send a thousand or five hundred newsletters in, that just, you know, are innocuous on the front, that describe, “It’s winter. These are the things to stay warm and cool.” Buried on the inside, in very small text, would be the actual important information that we want to get through. They found those out, and we anticipate they will, but the number that get through is enough to be able to transfer from prisoner to prisoner. And again, our leaders especially are transferred. Imam Siddique Hasan, even in the lead-up to this strike, has been withdrawn his phone privileges, thrown in solitary. And our leaders consistently have been retaliated against physically and also tortured through solitary confinement. So, it’s not to be taken lightly. But we’ve found, through telephone communication, connection, relationships with families, getting information, also direct communication through visits, and a number of different creative ways, that we can’t explain all to you, but we definitely can get the word out. And the great part is that prisoners share this information. So, even if it’s only sent to one person, that gets shared to another person, that goes to another facility. So, it can get shared either through word of mouth or directly through the piece of paper. But word travels quickly throughout prisons. I want to bring Heather Ann Thompson into this conversation. Professor Thompson, can you talk about the timing of this strike? It’s soon after the prison uprising, a few months ago, that led to seven prisoners killed. But it also began on the forty-seventh anniversary of the killing of George Jackson at San Quentin. And it ends on September 9, the beginning of the Attica uprising here in New York. Well, I mean, as the previous guests have noted, Lee was a really serious wake-up call, not so much for people on the inside — they were well aware of how catastrophic conditions were — but certainly for the outside. It was a real wake-up call just how barbaric the conditions are and that people on the inside needed to stand together to resist the overcrowding, the terrible medical care, the inability to ever get out because of the draconian laws that put them there. And the choice of August 21, which was the death of George Jackson, is also significant, because it was really indicative, then in 1971 and today, that part of being sentenced to time in prison in this country is to risk death, to risk death at the hands of guards, to risk death because of the brutal system, the lack of medical care. So the choice to begin this nationwide resistance to the conditions inside being George Jackson’s death was deeply significant. Tying it to the Attica rebellion is so important. Of course, the Attica brothers, back forty-seven years ago, even though they were in New York and George Jackson was killed in California, they heard about it immediately and were moved to stand together to resist the conditions, that were brutal then and have gotten even more so in the subsequent decades. Certainly for the men inside of Attica, who had been, like the men in California’s prisons, enduring terrible medical conditions, lack of decent food, abusive guards — all of the same things that we see today — back in 1971, when George Jackson was killed and word traveled to Attica, people went to the mess hall that morning in utter silence, wearing black armbands, to stand and recognize the significance of Jackson’s death. Jackson was significant because he had been writing from prison to the world, telling everyone what these conditions were like. 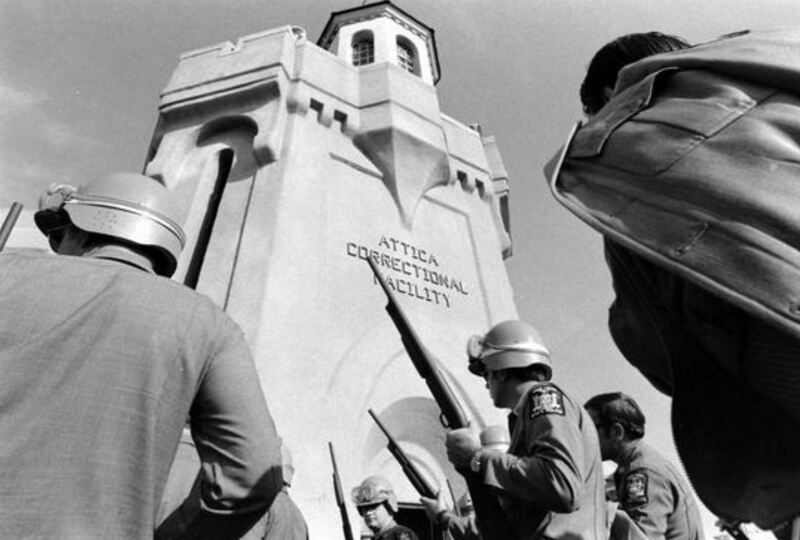 And not too much after that, not too much longer after that, the Attica men stood together — 1,300 of them stood together — again, like today, across differences of religion, across racial lines, and they told the state of New York that they needed to have better conditions inside of the prisons. That, unfortunately, was ended extremely brutally by the state of New York — many people killed, many people tortured. Behind bars right now, in a way that we’re not even aware of, there’s a whole lot of people standing together to let us know that this system is severely broken and we’ve got to change. But what this really shows us today is that no matter how severe the repression, people will stand together as human. They will continue to stand together. It’s really significant that in 2016 we saw thousands and thousands of prisoners stand up, and again, today, we are seeing more. It will be interesting to see how many we will actually know about right away. The repression inside is severe, and everyone will have to make their own choices as to whether or not they can be public about what they’re doing. But behind bars right now, in a way that we’re not even aware of, there’s a whole lot of people standing together to let us know that this system is severely broken and we’ve got to change. Amani Sawari, you’re on the outside. How did you get involved with organizing this strike? And what do you think people on the outside can do? So, the way that I got involved was actually through Twitter. One of the jailhouse lawyers reached out to me, direct message, and asked if they could host the strike on my website, SawariMi.org. I was happy to do so. That’s where the demands were posted, after they had put them out on Twitter originally. That’s also where the list of endorsements is. There are a little over two hundred right now, throughout the country, that are saying, “We’re behind this. We’ll do what we can to support.” There is also where the news and press releases are collected. After accepting that request via Twitter, I talked to one of the jailhouse lawyers on the phone, and he let me know why they were doing this. They originally had planned to do this in 2019. But after Lee had happened, they expedited the date and brought it up to 2018, so that they could have a direct response to what happened. In terms of what people on the outside can do. We have a list of events on It’s Going Down, as well as SawariMi.org, around the country. Just show up at one of those events. We’re going to have marches. We’re going to have protests, pickets in front of businesses that use prison slave labor. That’s another thing that people can do, is be really intentional about where they’re spending their money. Our dollar is our vote in this system, and when we choose to buy clothes or fast food or get our insurance or our gas from places that participate in prison slave labor, then we are fueling that system and allowing it to persist. But when we choose to just make that alternative choice, then we can really suffocate that system. And prisoners are doing that. They have to do that when they boycott. All the money that they spend goes towards the prison, so they’re not allowed to get any of those privileges. But we could just make the simple choice of just making that alternative. They have no alternative. So if they can do it, we can definitely support them by doing the same out here. Heather Ann Thompson, in the last minute we have, can you talk about the repression and retaliation prisoners face if they were to participate in this strike? It can be severe. We should heed Amani’s point that support on the outside is critical. Eyes on what’s happening on the inside is critical. One of the things that Attica shows us is not just that it’s important to support folks when they’re protesting on the inside in the moment when they’re protesting, but to keep eyes on this throughout. And how do people keep eyes on it? It’s highly likely that there will be folks that will experience some serious retaliation from prison management, and we’ve got to watch what’s going on, demand entry, provide lawyers, and make sure that folks on the inside are protected. Republished from Democracy Now! . Cole Dorsey is a formerly incarcerated member of the Incarcerated Workers Organizing Committee and a prison strike organizer.